They made me think of old romance. Faded Shabby colors and vintage cottage charm. I added them in for a bit of Christmas in Summer fun. I love their old mottled luminescent colors. and they are a near perfect match to the peonies. and are drying out already. But sure enjoying their sweet look and scent for now! Oooo, I love the colors in this vignette. The flowers are beautiful, and that silver and white, fantastic! 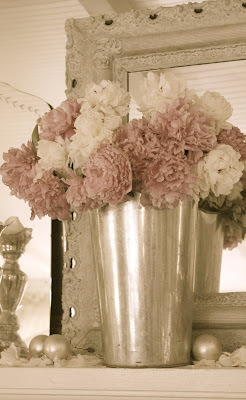 The peonies look so pretty in the silver urn! The peonies are brautiful and the pink and silver make such a beautiful vignette. So delicate, the colors are so soft. I love the silver urn, it is lovely. I'm glad you captured these shots before the peonies died. They really make great dried flowers, too. 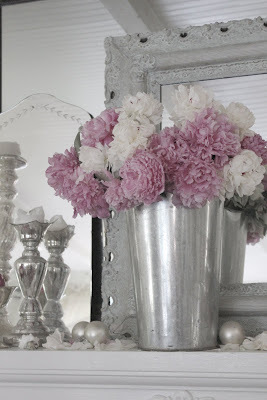 Pink and white peonies with silver, beautiful. I love your summer mantle vignette. Your photos are always lovely. Lovely mantle! The colors of the flowers are just perfect with the silver! 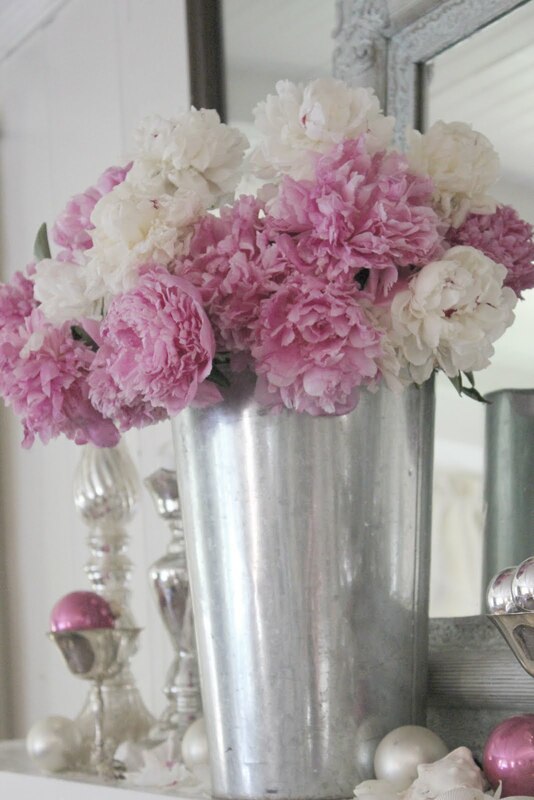 How lovely that is, the pink peonies with the silver. Just beautiful! 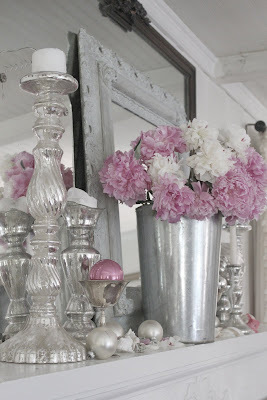 Courtney, Your mantel display is gorgeous and I love the peonies in the silver vase. Thanks for linking to Open House this week. Though I have a whole garden full of roses, peonies are my favorite flower. Yours are beautiful!! Beautiful photos Courtney, peonies are one of my very favorites. Gotta love all things pink. Thanks for sharing. Wow, Courtney! It's like Old Hollywood meets Paris Apartment. I *heart* your mantel! 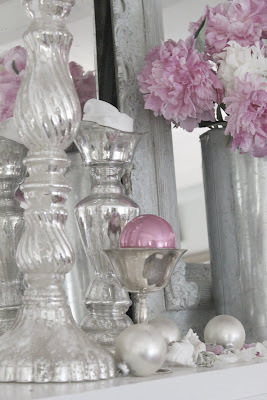 Ohhh my...your summer pink, white, and silver mantel is sooo beautiful, my friend! 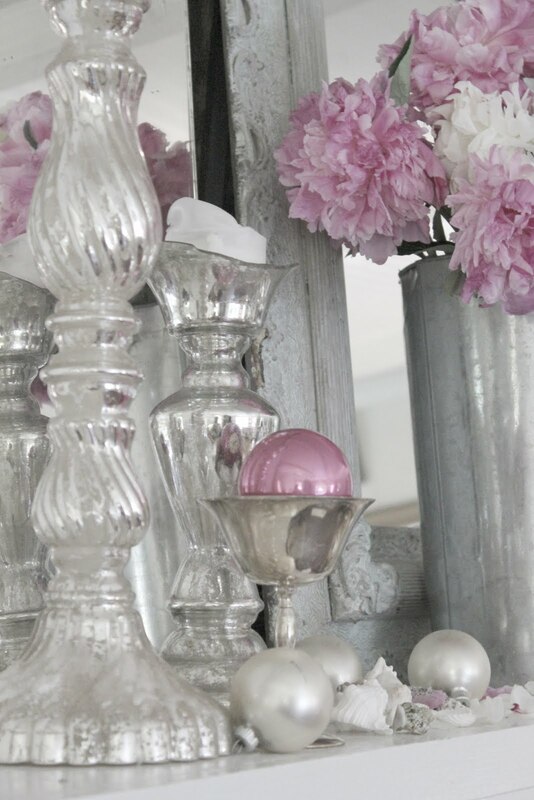 I love pink paired with silver...it's soooo soft, feminine, and elegant! Your pink peonies are gorgeous and I love the pretty pink ornaments too! Such a sweet mantel vignette...thank you for sharing it with us today, sweet friend! Those awesome peonies just don't last long enough, do they, Courtney? :) I hung on to mine til they were wrinkled and drooping over the side of the vase. lol! I can't believe that you actually dug out some Christmas ornaments (where did I pack mine....????) but they really look cool and clean next to the pink! You are so talented, girl! How beautiful. I especially love the top photo. It could be a card. So pretty, the last of my peonies just finished, always sad to see them finish! I adore your mantel vignette, and the touch of "Christmas" sparkle! Gorgeous and i love the composition along with your different textures. You have such an eye! It looks so fresh and cool. Just the thing for a hot summer day. Beautiful and fresh ........ I love flowers on the mantel.